One of the mysterious Mega Stones. Give it to Gengar to let it Mega Evolve! I WILL ACCEPT DONATIONS OF ANY KIND, NEED STUFF FOR MY HUNT! (If I get lots of stuff from the hunt and you donated, I can give you free shinies/albinos/deltas (or you get a discount if you donated less)! Most likely gonna do a Gengar or Marowak hunt at the end of 2019! Looking for 99% + Marowak breeding pairs! PLEASE HELP ME OUT HERE, I BEG YOU! 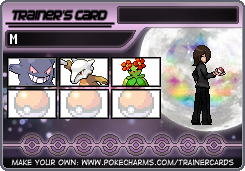 : https://pokefarm.com/forum/thread/201243/Unpermanent-Mega-Evolution LOOKING FOR Ghostium Z , I HAVE A WATERIUM Z Challenge the Gym and earn the badge! People who've donated so far!